LinkedIn has formalized the blending of Lynda.com courses and its own professional data and networking services with the launch of LinkedIn Learning. This new site provides access to "thousands" of video courses in an on-demand format that can be viewed on mobile devices; it includes transcripts and closed captions and offers administrative tools for tracking user analytics. A major area of emphasis will be education environments, including K-12 and higher education. LinkedIn acquired Lynda.com in spring 2015. LinkedIn itself will soon become part of Microsoft. That acquisition was announced in summer 2016 and is expected to be finalized by the end of this year. LinkedIn Learning is intended to capitalize on the emerging market of just-in-time training to address the professional development needs among its 450 million worldwide members. As a blog article on the news explained, "The pressure on individuals and organizations to adapt to change has never been greater. The skills that got you to where you are today are not the skills to prepare you for tomorrow." Analytics and reporting that enable the employer or learner to track time on task and assessment results. 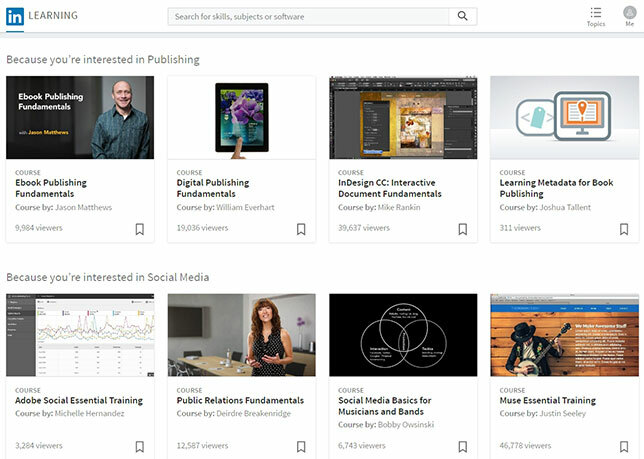 The company is positioning LinkedIn Learning as a way to support faculty, staff and students with e-learning for career development and technical training and sources of media for flipping the classroom. At Georgetown students use the online training for help with class projects. Faculty use it for their own professional development and to support their flipped learning efforts. Staff use it to build their work skills. The result, according to Beth Marhanka, is that her staff members "spend less time answering basic questions. We're able to refer people to lynda.com and say, 'Go watch this movie. Do some basic training and come back when you're working on your project. You can get one-on-one time with us then.'" Marhanka called the use of Lynda.com a "much more efficient way for us to meet instructional needs. We can spend our time on higher-level skills and unique requests, rather than the rote parts of learning."